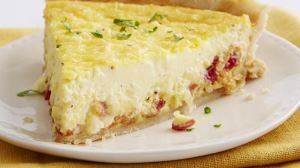 This quiche filling is like liquid satin–it’s just so rich and creamy, not at all “eggy tasting.” The original recipe used a dash of nutmeg instead of the cayenne pepper, feel free to give it try! 3. Heat oven to 425°F. With floured rolling pin, roll pastry into round 2 inches larger than upside-down 9-inch quiche dish or glass pie plate. Fold pastry into fourths; place in quiche dish. Unfold and ease into dish, pressing firmly against bottom and side. Trim overhanging edge of pastry 1 inch from rim of pie plate. Fold and roll pastry under, even with plate; flute as desired. 5. Reduce oven temperature to 325°F. Sprinkle bacon, cheese and onion in pie crust. In medium bowl, beat eggs slightly; beat in remaining filling ingredients. Pour into quiche dish. 6. Bake 45 to 50 minutes or until knife inserted in center comes out clean. Let stand 10 minutes before serving.